Ron Gilbert and Gary Winnick have an enviable list of game credits to their names: Maniac Mansion, Day of the Tentacle, Loom, The Secret of Monkey Island, Zack McKracken and the Alien Mindbenders, and a pile of others. And now the old-time LucasArts veterans have got together on Kickstarter, where they're whipping up support for an "all-new classic adventure game" called Thimbleweed Park. Thimbleweed Park is "the true spiritual successor to Maniac Mansion and Monkey Island," according to the Kickstarter pitch, and it certainly looks the part, not just through its pixel-art graphics but its interface as well, which is very reminiscent of the old LucasArts style. It's promised to feature five playable characters who can be switched between at any time, multiple endings, hundreds of locations, and two levels of difficulty to ensure that novices aren't left out in the cold. 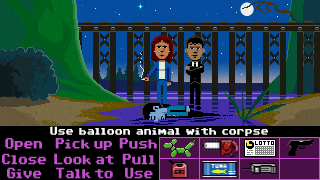 "We want Thimbleweed Park to be like an undiscovered classic LucasArts' adventure game you'd never played before," they wrote. "A game discovered in a dusty old desk that puts a smile on your face and sends a wave of nostalgia through you in the same way it does for us." The process of developing the game is being kept as Lucas-like as possible. Gilbert and Winnick will share design and writing duties; Gilbert will handle the majority of the programming, while Winnick will do the art. Six months into development, another programmer and artist will be hired, along with a part-time musician, while testers will be brought in as the game approaches completion. The Kickstarter is seeking $375,000, enough to fund development of the game as a "serious, full-time project." The estimated delivery date is August 2016, although they acknowledge in the "risks and challenges" section that "we probably will be late, but not by a lot and the game will be better for it. That's just the reality of making a game and we're going to be honest about that." So far, people don't seem too put off by the prospect: Just a few hours after the Kickstarter went live, it's already raised more than $71,000.